George Graham Reviews Al Stewart's "Sparks of Ancient Light"
It's interesting to consider some long-time veteran performers, whose careers took flight in the period of time -- say the mid 1960s to the mid 1970s -- that the commercial media defines as "classic rock." While their hits from a generation or more ago are repeated endlessly, a good number of these artists are very much active, making excellent new music. But the commercial media seems to have no interest in it, perhaps because it doesn't generate the proper level of nostalgia necessary to sell products to Baby Boomers. Likewise, many of these artists are now on independent record labels. There's a long list of iconic performers making notable new recordings, from Jackson Browne and Joan Baez to Little Feat and a pairing of Jack Bruce and Robin Trower. Almost all their new music has remained obscure, and seems in no danger of any exposure in corporate media. This week, we have another long-time artist who has released a fine new recording on an independent label, and is likely to have a similar fate. 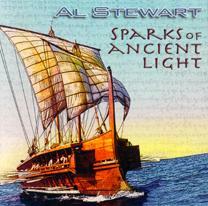 Al Stewart has just released his 18th album of new music called Sparks of Ancient Light. In his 40-plus year career, Al Stewart has been in a lot of interesting musical places. Starting at age 16, his first goal was to be a guitarist in a rock band. He brought his first guitar from Andy Summers, who would later go to form the Police. One of his early guitar instructors was Robert Fripp, later of King Crimson. The Scottish native moved to London in 1965, where his roommate was Paul Simon, during the time the latter was in London. He also had a relationship with Yoko Ono, before the latter met John Lennon. Stewart served as the emcee at a club where the English folk scene was taking shape, where people like Fairport Convention, Ralph McTell, and Cat Stevens regularly played. In that environment, he took increasingly to writing and singing his own songs, and released his first single in the UK in 1966, and his first album, Bedsitter Images in 1967. The latter was later released in the US in the mid 1970s, after major international hits from his album Year of the Cat. Like many folkies, Stewart, in his early days, was somewhat self-absorbed in his lyrical approach. But he achieved his fame as he moved into narrative songs, many of them based in history. Stewart has been living in the US since the mid 1970s, but during the punk and alternative rock period -- which was a kind of antithesis of his erudite narratives -- his output was rather slim. He re-emerged in the 1990s, taking a more acoustic approach, and began working with guitarist Laurence Juber, a former member of Paul McCartney's Wings. The first-US released result of that collaboration, Between the Wars was a superb, acoustically instrumented album very much in the historical mode. After a UK-only release in 2000, Stewart issued A Beach Full of Shells in 2005, which was of similarly high quality. Now Stewart is out with Sparks of Ancient Light, and I suppose it can be considered a sequel to A Beach Full of Shells, with many of the same musicians, including guitarist Juber, who serves as producer, and a new batch of songs mostly set in the past. While there are a couple of love songs, they are generally in the second or third person. History, though, provides the setting for most of the lyrics, from songs about specific figures, to narratives that were set in a particular period. In fact, Stewart is specific in starting and ending the album with songs set in the year 1896 -- one from each side of the Atlantic. But he also sets his lyrics in periods from ancient Greece to 1979 and the fall of the Shah of Iran. As usual, his songs are not particularly musically challenging to casual listeners, but are pleasing in sound, and often evocative of earlier periods. Al Stewart's new CD Sparks of Ancient Light is very much a continuation of his last album from three years ago, A Beach Full of Shells. The personnel is largely the same, with guitarist Laurence Juber and keyboard man Jim Cox being prominent, along with the Section String Quartet also holding over. They provide very tasteful playing, generally understated and largely acoustic in sound. Stewart's writing remains high in quality and pleasingly literate, and generally good-natured in mood, and at 63 years old, his vocals are as good as ever. Our grade for sound quality is close to an "A." The instrumentation and vocals are very well-recorded with a pleasant lack of added studio effects, and a clean, warm sound. The dynamic range is better than average for a pop CD, with less than the typical amount of volume compression. Alistaire Ian Stewart has been recording his songs now for 42 years. One would think from the media that his career stopped after Year of the Cat over 30 years ago. But this musical storyteller remains at the top of his game, continuing to do some of his best work. (c) Copyright 2008 George D. Graham. All rights reseved.